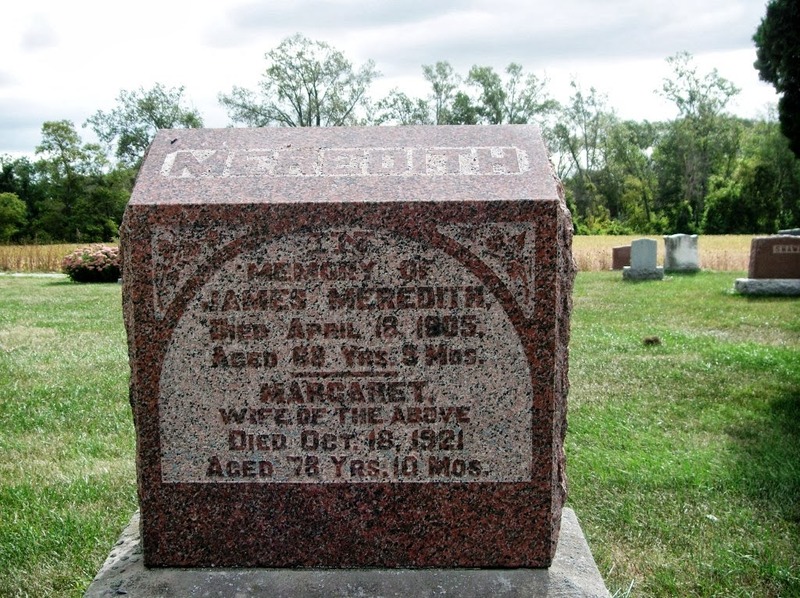 Margaret Ann McKenzie was born 12 Dec 1832 in Kent County, Ontario, Canada. Margaret Ann McKenzie was the daughter of Alexander McKenzie (abt 1810- ) and Susan Williams (abt 1821-1885). Margaret Ann McKenzie married James Meredith (18 Jul 1836 - 18 Apr 1905) on 14 May 1862 in Ontario, Canada. Margaret Ann McKenzie died 18 Oct 1921 and was buried 21 Oct 1921 in Arnold Cemetery, Chatham, Ontario, Canada. The cause of her death was an accident to her right hip. Her death is registered by Miss Meredith, daughter, who also lived at 154 Selkirk St., Chatham, Ontario. This may be Gladys, because her other two known daughters were married.